Shoulder instability is an condition frequently seen in sports. Traumatic shoulder dislocations are common in contact and collision sports, such as football, rugby, lacrosse, and wrestling. These injuries are usually easy to diagnose, since the shoulder and arm look abnormal as the humeral head (or the “ball” of the ball-and-socket joint) slides partially or completely out of the glenoid (the “socket”). On the other hand, instability can take on more subtle forms, especially in athletes who participate in overhead sports. Historically dislocated shoulders were not thought to be a big concern. The young football player, for example, was taken to the emergency room and the shoulder was reduced into its proper position. He would be placed in a sling for 4-6 weeks and told that he would be fine. In recent years, sports medicine surgeons have started to question this treatment strategy. In athletes under the age of 21, many studies have shown that after an initial dislocation recurrence rates are extremely high, usually between 60% and 100%. The underlying cause for the recurrent nature of dislocations has been thought to be structural damage that occurs at the time of the first dislocation. Usually the labrum, a cartilage bumper surrounding the glenoid, is torn off the glenoid. The capsule and ligaments that surround the humeral head and glenoid get stretched out as well. The combination of the labral tear and capsular stretching allow the shoulder to dislocate with increasingly less force as it happens more often. 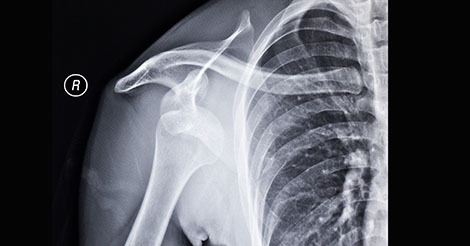 Management of a first-time shoulder dislocation is evolving. Emergent reduction of the dislocation is necessary, either on site by an athletic trainer or physician comfortable with this procedure, if possible, or in the emergency room. After reduction, short-term sling use for comfort and physical therapy for range of motion and strengthening are beneficial. Consulting a surgeon who frequently treats this injury is appropriate. Surgical repair after a first dislocation is controversial. Advocates of early surgical treatment argue that the surgery is somewhat easier in this setting and that the surgery might prevent damage caused by more dislocations. Unfortunately, these injuries often occur during a sports season, and choosing to proceed with surgery would definitely end any chance of playing again that season. If the athlete wants to try to finish the season, rehabilitation and a brace to help lessen the chance for further dislocations are reasonable options. If he or she makes it through the season, then a decision about pursuing surgical treatment can be made at a later date. If it occurs again, stabilization surgery is probably the best option. Fortunately these surgeries are becoming much less invasive. While still used in some circumstances, large open surgeries with long incisions are needed much less often than in the past. Most of the time, arthroscopic procedures are successful at preventing recurrence and allowing the athlete to return to sports. Thermal shrinkage, popular even earlier this decade, has been shown to have a high failure rate. Now procedures to repair the labrum and tighten the capsule through 2 or 3 small incisions are the standard. While the surgery might be less invasive, the rehabilitation process is still lengthy, often taking four to six months to fully restore range of motion and strength while preserving stability. Tips for a better outcome after surgery. Shoulder dislocations are a difficult problem facing contact and collision athletes. However, if nonoperative treatment is unsuccessful or if the athlete wants to minimize the chance of it happening over and over, minimally invasive surgical options are available. Surgery now vs surgery later.